Jamie McGough has more than 20 years of consulting experience in executive compensation and related governance. 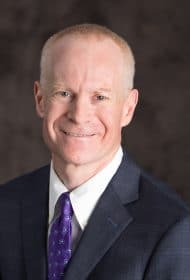 His work has included the design and structuring of all aspects of executive and outside director compensation including short- and long-term incentive design, supplemental retirement programs and change-in-control arrangements. He leads our Performance Measurement Team and has done considerable work linking shareholder value and executive compensation programs. He currently serves on Meridian’s Executive Committee. Jamie’s work encompasses a wide range of small and large, public and private, consumer products, energy, industrial, service, and technology firms, and regularly consults with boards of directors. Prior to joining Meridian, Jamie consulted for 18 years in executive compensation at Hewitt Associates and was a Principal. Prior to that he worked in the management consulting practice of a Big Four accounting firm focusing on mergers and acquisitions and business valuation.